New videos showing MatchCrete™ Clear. Last week I posed two new videos on the Roadware YouTube Channel showing Roadware MatchCrete™ Clear in action repairing cracks in an exposed aggregate concrete sidewalk and patio. I also posed a video on how to repair a hairline crack in a driveway or sidewalk.How to repair a crack in an exposed aggregate concrete patio using Roadware MatchCrete™ Clear in a 600ml cartridge. How to repair an exposed aggregate concrete sidewalk using Roadware MatchCrete™ Clear in the 50 ml cartridge. How to repair a hairline crack in a driveway, sidewalk, patio, or pool deck with Roadware MatchCrete™ Clear. Using Roadware MatchCrete™ Clear to repair cracks on the historic Stone Arch Bridge. This week the City of Minneapolis used Roadware MatchCrete™ Clear to repair cracks in the exposed aggregate walkway surface on the Stone Arch Bridge in Minneapolis, Minnesota. The Stone Arch Bridge is unique to the Mississippi River and features 23 arches, is 2100 feet long and 28 feet wide. The bridge was built by railroad baron James J. Hill in 1883 and served as a working railroad bridge until 1965. Today the bridge is mostly used by walkers and bicyclists. The bridge also hosts many festivals and public events in the summer months. In preparation for the summer festival season, City of Minneapolis crews used Roadware MatchCrete™ Clear to repair cracks in the exposed aggregate walkway surface. MatchCrete™ Clear is combined with matching rock to repair cracks and restore a consistent walking surface. into the crack up to surface level. 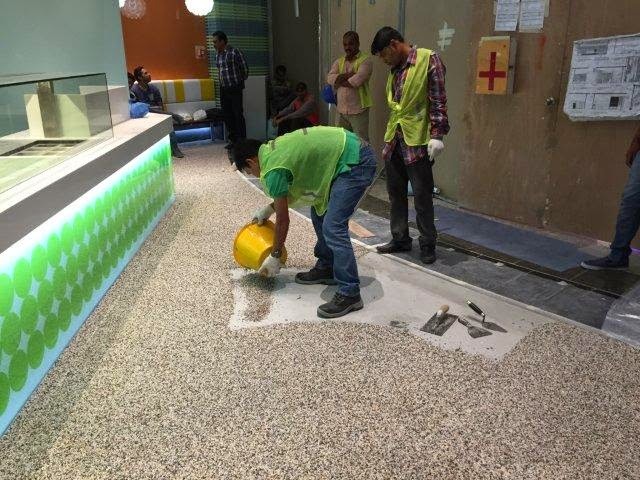 Next, two-part blended MatchCrete™ Clear is poured into the repair up to the surface. This fills in all the voids between the stones and seals the crack. MatchCrete™ Clear is a semi-ridged material that will support all kinds of traffic from pedestrians to industrial fork lifts. Repairs will have a, wet” look for a few months and will naturally dull over time. A clear coat sealing over the entire surface will off-set this effect. MatchCrete™ Clear repair in exposed aggregate concrete. 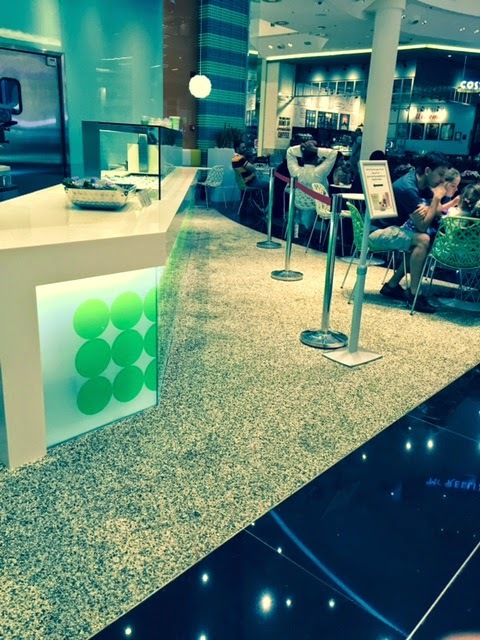 In a few months, Repairs with MatchCrete™ Clear will dull and blend into the surrounding concrete. Over time, repairs will become less shiny. MatchCrete™ Clear repairs 18 days later. I revisited the repairs on the bridge 18 days later. The surface has been sealed. The repairs are performing as expected. Roadware MatchCrete Clear is available is 50ml and 600ml cartridges and two gallon bulk kits. Recently a customer sent me several cut sheets from other manufactures of look-alike concrete repair products and asked me to compare them with Roadware 10 Minute Concrete Mender™. Here is how it played out. We here at Roadware are familiar with the knock-off and look-alike products you submitted for our review. These products fall into the category of a low viscosity polyurea. 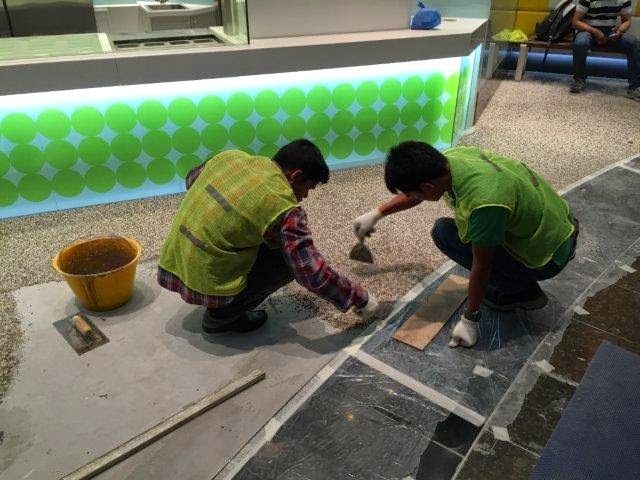 Basically, what they have done is modify a standard polyurea joint filler and added a solvent to make it appear as a high-penetration Concrete Mender™-like product. They are all missing the key property and process that makes Roadware 10 Minute Concrete Mender™ unique and superior in overall performance. This process is called Microdoweling™. Roadware’s Microdoweling™ process uses a proprietary formula of polyurethanes and additives to achieve a measured surface tension of 0.026 N/m. (1/3 of water) Surface tension is a measurement of a liquids ability to break free of its own molecular friction and flow into something else. Microdoweling™ is why Roadware 10 Minute Concrete Mender™ can penetrate easily into a concrete surface under adverse conditions, as is the case in distressed, broken and cracked concrete. The lowest viscosity for easier mixing and blending. Easy, one-step polishing and grinding. This material will not melt, smear, or gum up diamond polishing pads. An excellent parging compound. Experienced and advanced packaging. Roadware cartridge packaging is reliable and works well in the field. End-user color blending. New MatchCrete™ Concrete Mender can easily be manipulated into many colors by modifying the sand or adding pigments. A modulus of elasticity that is slightly less then the concrete so repairs will move with the concrete and not against it. Needle tip application. A complete system of needle-tip cartridge mixers for pin-point application and hairline crack repair. It’s all in the data. Roadware backs up the Microdoweling™ process with independent testing data and publishes it on our website, www.roadware.us. Thank you for continued support and please call us any time if you have any questions. Roadware MatchCrete™ Clear (MCC) is a two component aliphatic polyurethane for repairing cracks, spalls, and joints in concrete subject to UV exposure from sunlight. This material is clear in appearance when applied and cured. Colored sand and pigments may be added to create color stable repairs that match most any decorative or shade of concrete surface. MCC will not significantly change color with exposure to sunlight over time. Use Roadware MatchCrete™ Clear (MCC) to quickly repair cracks and spalls in concrete that is exposed to sunlight and where a color compatible appearance is desired. Who would want a “clear” concrete repair product? What could you use it for? For over 15 years, Roadware manufactured 10 Minute Concrete Mender™ in one standard concrete grey color. It was simple and straight forward. Concrete is grey! The repairs should be grey. Then everything changed. In the past five years, decorative concrete has exploded into the marketplace. Now you can have your concrete in nearly limitless color choices and textures. 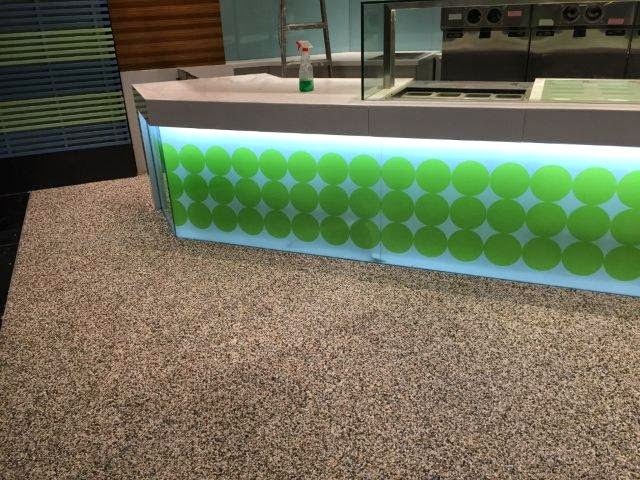 We developed MatchCrete™ Clear to give you endless color possibilities as well. So, what can you do with MatchCrete™ Clear? Clear- Use MCC without sand to create an eye pleasing joint that will not distract from the overall look. Colored and Clear – Stain the sidewalls of a crack or joint and fill with MCC to create a colored joint effect. Colored Sand- Use MCC with colored sand or colored quartz to make nearly any color repair. Colored Aggregate- Use MCC and colored aggregate to make a granite or stone effect. Concrete Dust- Use MCC and concrete dust to make a portland concrete look. Dry Pigment- Use MCC, sand, and some dry concrete pigment to create most any matching color. Dry Shake- Add a bit of dry shake color to your MCC repair for matching color effects. Joints and Cracks- Fill joints and cracks around concrete, stone, tile, or terrazzo without becoming an eyesore. Exposed Aggregate- Repair cracks, spalls, and knock-outs. Pool Decks- Repair coatings and de-laminations. Joints- Use MCC for polished joints that match the concrete and look good. Design- Use MCC to embed items into the concrete and polish the surface flush. Lighting- Use MCC to embed LED lighting into concrete walkways and decks for dramatic effects. Use MCC in areas exposed to sunlight where color stable repairs are necessary such as driveways, sidewalks and entryways. Use MCC to repair cracks, joints and spalls in high profile building entrances, courtyards, and common areas. Repairs with MCC will not distract from the overall appearance and design.